A trio of items on the Ann Arbor city council’s Aug. 7, 2014 agenda have been approved, which relate to a future project at Research Park Drive. The project itself was not on the agenda – but it would construct six new buildings on six parcels, each with associated surface parking and storm water detention. One of the proposed buildings would be a tennis facility. The tennis facility required an amendment to the ORL zoning district, which currently does not allow outdoor recreation uses. The three associated items approved by the council were: (1) an area plan; (2) rezoning of 16.6 acres comprising six parcels from RE (research district) to ORL (office/research/limited industrial district); and (3) an amendment to the ORL zoning classification to allow the planning commission to grant special exception uses for recreational facilities. Recommendations of approval for these items came at the planning commission’s June 3, 2014 meeting. Initial approval was given by the city council for the rezoning items at its July 7, 2014 meeting. So a vote for approval at the council’s Aug. 7 meeting was the final vote needed for enactment. 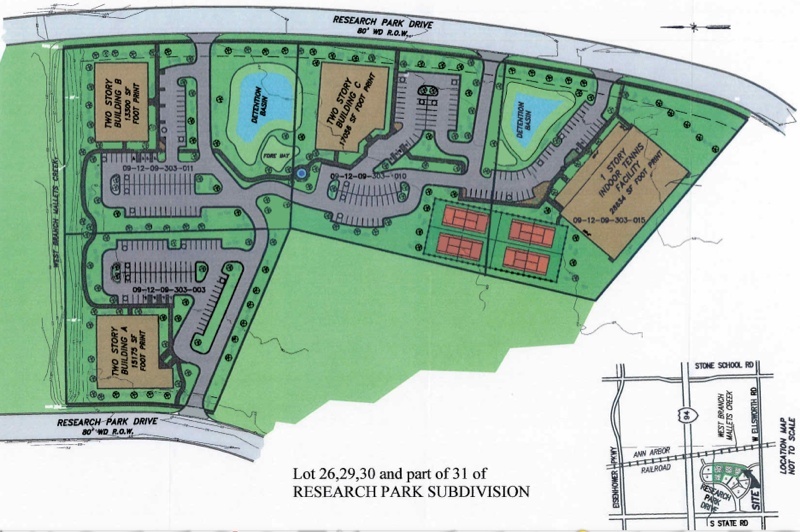 The proposed area plan – which is less detailed than a site plan – includes an indoor-outdoor tennis facility on one of the lots. It also includes five two-story buildings that could accommodate office, research, and limited industrial uses on the remaining lots, each with their own parking lot and access point to Research Park Drive. Prior to construction, the project must go through the city’s site plan approval process, which might require a traffic impact study. Aerial view showing Research Park Drive parcels. 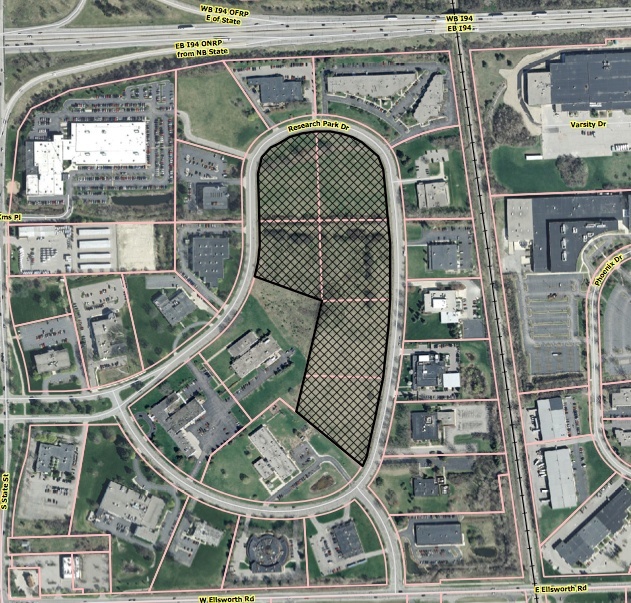 Area plan for four sites in a proposed development on Research Park Drive. The image is oriented with east at the top.